This article is about the original Netscape Navigator product (versions 1 to 4.08). For the final 2007 release, see Netscape Navigator 9. For a full list of Netscape software releases, see Netscape (web browser). Netscape Navigator was a proprietary web browser, and the original browser of the Netscape line, from versions 1 to 4.08, and 9.x. It was the flagship product of the Netscape Communications Corp and was the dominant web browser in terms of usage share in the 1990s, but by 2002 its use had almost disappeared. This was primarily due to the increased use of Microsoft's Internet Explorer web browser software, and partly because the Netscape Corporation (later purchased by AOL) did not sustain Netscape Navigator's technical innovation in the late 1990s. The business demise of Netscape was a central premise of Microsoft's antitrust trial, wherein the Court ruled that Microsoft's bundling of Internet Explorer with the Windows operating system was a monopolistic and illegal business practice. The decision came too late for Netscape, however, as Internet Explorer had by then become the dominant web browser in Windows. The Netscape Navigator web browser was succeeded by the Netscape Communicator suite in 1997. Netscape Communicator's 4.x source code was the base for the Netscape-developed Mozilla Application Suite, which was later renamed SeaMonkey. Netscape's Mozilla Suite also served as the base for a browser-only spinoff called Mozilla Firefox. The Netscape Navigator name returned in 2007 when AOL announced version 9 of the Netscape series of browsers, Netscape Navigator 9. On 28 December 2007, AOL canceled its development but continued supporting the web browser with security updates until 1 March 2008. AOL allows downloading of archived versions of the Netscape Navigator web browser family. AOL maintains the Netscape website as an Internet portal. Mosaic Netscape 0.9, a pre-1.0 version. Note the image of the Mozilla mascot, and the Mosaic logo in the top-right corner. Netscape Navigator was inspired by the success of the Mosaic web browser, which was co-written by Marc Andreessen, a part-time employee of the National Center for Supercomputing Applications at the University of Illinois. After Andreessen graduated in 1993, he moved to California and there met Jim Clark, the recently departed founder of Silicon Graphics. Clark believed that the Mosaic browser had great commercial possibilities and provided the seed money. Soon Mosaic Communications Corporation was in business in Mountain View, California, with Andreessen as a vice-president. Since the University of Illinois was unhappy with the company's use of the Mosaic name, the company changed its name to Netscape Communications (suggested by product manager Greg Sands ) and named its flagship web browser Netscape Navigator. 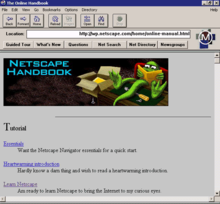 Netscape announced in its first press release (13 October 1994) that it would make Navigator available without charge to all non-commercial users, and beta versions of version 1.0 and 1.1 were indeed freely downloadable in November 1994 and March 1995, with the full version 1.0 available in December 1994. Netscape's initial corporate policy regarding Navigator claimed that it would make Navigator freely available for non-commercial use in accordance with the notion that Internet software should be distributed for free. However, within two months of that press release, Netscape apparently reversed its policy on who could freely obtain and use version 1.0 by only mentioning that educational and non-profit institutions could use version 1.0 at no charge. The reversal was complete with the availability of version 1.1 beta on 6 March 1995, in which a press release states that the final 1.1 release would be available at no cost only for academic and non-profit organizational use. Gone was the notion expressed in the first press release that Navigator would be freely available in the spirit of Internet software. Some security experts and cryptographers found out that all released Netscape versions had major security problems with crashing the browser with long URLs and 40 bits encryption keys. The first few releases of the product were made available in "commercial" and "evaluation" versions; for example, version "1.0" and version "1.0N". The "N" evaluation versions were completely identical to the commercial versions; the letter was there to remind people to pay for the browser once they felt they had tried it long enough and were satisfied with it. This distinction was formally dropped within a year of the initial release, and the full version of the browser continued to be made available for free online, with boxed versions available on floppy disks (and later CDs) in stores along with a period of phone support. During this era, "Internet Starter Kit" books were popular, and usually included a floppy disk or CD containing internet software, and this was a popular means of obtaining Netscape's and other browsers. Email support was initially free, and remained so for a year or two until the volume of support requests grew too high. During development, the Netscape browser was known by the code name Mozilla, which became the name of a Godzilla-like cartoon dragon mascot used prominently on the company's web site. The Mozilla name was also used as the User-Agent in HTTP requests by the browser. Other web browsers claimed to be compatible with Netscape's extensions to HTML, and therefore used the same name in their User-Agent identifiers so that web servers would send them the same pages as were sent to Netscape browsers. Mozilla is now a generic name for matters related to the open source successor to Netscape Communicator and is most identified with the browser Firefox. When the consumer Internet revolution arrived in the mid-to-late 1990s, Netscape was well-positioned to take advantage of it. With a good mix of features and an attractive licensing scheme that allowed free use for non-commercial purposes, the Netscape browser soon became the de facto standard, particularly on the Windows platform. Internet service providers and computer magazine publishers helped make Navigator readily available. An important innovation that Netscape introduced in 1994 was the on-the-fly display of web pages, where text and graphics appeared on the screen as the web page downloaded. 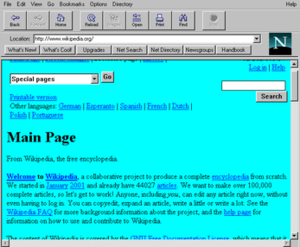 Earlier web browsers would not display a page until all graphics on it had been loaded over the network connection; this often made a user stare at a blank page for as long as several minutes. With Netscape, people using dial-up connections could begin reading the text of a web page within seconds of entering a web address, even before the rest of the text and graphics had finished downloading. This made the web much more tolerable to the average user. In the marketplace, however, these concerns made little difference. Netscape Navigator remained the market leader with more than 50% usage share. The browser software was available for a wide range of operating systems, including Windows (3.1, 95, 98, NT), Macintosh, Linux, OS/2, and many versions of Unix including OSF/1, Sun Solaris, BSD/OS, IRIX, AIX, and HP-UX, and looked and worked nearly identically on every one of them. Netscape began to experiment with prototypes of a web-based system, known internally as “Constellation”, which would allow a user to access and edit his or her files anywhere across a network no matter what computer or operating system he or she happened to be using. Industry observers confidently forecast the dawn of a new era of connected computing. The underlying operating system, it was believed, would become an unimportant consideration; future applications would run within a web browser. This was seen by Netscape as a clear opportunity to entrench Navigator at the heart of the next generation of computing, and thus gain the opportunity to expand into all manner of other software and service markets. With the success of Netscape showing the importance of the web (more people were using the Internet due in part to the ease of using Netscape), Internet browsing began to be seen as a potentially profitable market. Following Netscape's lead, Microsoft started a campaign to enter the web browser software market. Like Netscape before them, Microsoft licensed the Mosaic source code from Spyglass, Inc. (which in turn licensed code from University of Illinois). Using this basic code, Microsoft created Internet Explorer (IE). The competition between Microsoft and Netscape dominated the Browser Wars. Internet Explorer, Version 1.0 (shipped in the Internet Jumpstart Kit in Microsoft Plus! For Windows 95) and IE, Version 2.0 (the first cross-platform version of the web browser, supporting both Windows and Mac OS) were thought by many to be inferior and primitive when compared to contemporary versions of Netscape Navigator. With the release of IE version 3.0 (1996) Microsoft was able to catch up with Netscape competitively, with IE Version 4.0 (1997) further improvement in terms of market share. IE 5.0 (1999) improved stability and took significant market share from Netscape Navigator for the first time. There were two versions of Netscape Navigator 3.0; the Standard Edition and the Gold Edition. The latter consisted of the Navigator browser with e-mail, news readers, and a WYSIWYG web page compositor; however, these extra functions enlarged and slowed the software, rendering it prone to crashing. This Gold Edition was renamed Netscape Communicator starting with version 4.0; the name change diluted its name-recognition and confused users. Netscape CEO James L. Barksdale insisted on the name change because Communicator was a general-purpose client application, which contained the Navigator browser. By the end of the decade, Netscape's web browser had lost dominance over the Windows platform, and the August 1997 Microsoft financial agreement to invest one hundred and fifty million dollars in Apple required that Apple make Internet Explorer the default web browser in new Mac OS distributions. The latest IE Mac release at that time was Internet Explorer version 3.0 for Macintosh, but Internet Explorer 4 was released later that year. Microsoft succeeded in having ISPs and PC vendors distribute Internet Explorer to their customers instead of Netscape Navigator, mostly due to Microsoft using its leverage from Windows OEM licenses, and partly aided by Microsoft's investment in making IE brandable, such that a customized version of IE could be offered. Also, web developers used proprietary, browser-specific extensions in web pages. Both Microsoft and Netscape did this, having added many proprietary HTML tags to their browsers, which forced users to choose between two competing and almost incompatible web browsers. In March 1998, Netscape released most of the development code base for Netscape Communicator under an open source license. Only pre-alpha versions of Netscape 5 were released before the open source community decided to scrap the Netscape Navigator codebase entirely and build a new web browser around the Gecko layout engine which Netscape had been developing but which had not yet incorporated. The community-developed open source project was named Mozilla, Netscape Navigator's original code name. America Online bought Netscape; Netscape programmers took a pre-beta-quality form of the Mozilla codebase, gave it a new GUI, and released it as Netscape 6. This did nothing to win back users, who continued to migrate to Internet Explorer. After the release of Netscape 7 and a long public beta test, Mozilla 1.0 was released on 5 June 2002. The same code-base, notably the Gecko layout engine, became the basis of independent applications, including Firefox and Thunderbird. On 28 December 2007, the Netscape developers announced that AOL had canceled development of Netscape Navigator, leaving it unsupported as of 1 March 2008. Despite this, archived and unsupported versions of the browser remain available for download. In a 2007 PC World column, the original Netscape Navigator was considered the "best tech product of all time" due to its impact on the Internet. ^ "Roads and Crossroads of the Internet History". NetValley.com. Archived from the original on 6 February 2015. Retrieved 8 September 2014. ^ Clark, Jim (1999). Netscape Time. St. Martin's Press. ^ Tom Drapeau (28 December 2007). "End of Support for Netscape web browsers". The Netscape Blog. Archived from the original on 29 December 2007. Retrieved 29 December 2007. ^ "Greg Sands". Retrieved 20 February 2019. ^ "NETSCAPE COMMUNICATIONS OFFERS NEW NETWORK NAVIGATOR FREE ON THE INTERNET". AOL.com. Archived from the original on 7 December 2006. Retrieved 5 September 2015. ^ "NETSCAPE COMMUNICATIONS SHIPS RELEASE 1.0 OF NETSCAPE NAVIGATOR AND NETSCAPE SERVERS" (Press release). AOL.com. 15 September 1994. Archived from the original on 26 March 2005. Retrieved 5 September 2015. ^ Demailly, Laurent (22 July 1996). "Netscape (in)Security (problems)". Archived from the original on 29 January 1998. Retrieved 15 October 2011. ^ "Hackers Alert Netscape to Another Flaw". The New York Times. 26 September 1995. p. D19. Archived from the original on 16 January 1999. Retrieved 15 October 2011. ^ Mark Robbin Brown; Steven Forrest Burnett; Tim Evans; Heather Fleming; Galen Grimes; David Gunter; Jerry Honeycutt; Peter Kent; Margaret J. Larson; Bill Nadeau; Todd Stauffer; Ian Stokell; John Williams (1996). Netscape Navigator 3 Starter Kit. Que. ISBN 978-0-7897-1181-6. ^ Ladd, Eric. "Using HTML 3.2, Java 1.1, and CGI; Ch. 13, Frames". Archived from the original on 30 October 2007. ^ "Navigator Proxy Auto-Config File Format". Netscape Navigator Documentation. March 1996. Archived from the original on 18 December 2006. Retrieved 15 January 2011. ^ Watson, Dave (21 July 2001). "A Quick Look at Netscape". The Southern California OS/2 User Group. Archived from the original on 16 July 2011. Retrieved 16 August 2010. ^ "Download Web Browser - Internet Explorer". windows.microsoft.com. Microsoft. Archived from the original on 2 October 2003. Retrieved 5 September 2015. ^ "Microsoft Internet Explorer Web Browser Available on All Major Platforms, Offers Broadest International Support" (Press release). Microsoft. 30 April 1996. Archived from the original on 30 August 2013. Retrieved 8 September 2014. ^ Hamerly, Jim (January 1999). "Freeing the Source: The Story of Mozilla". O'Reilly. Archived from the original on 2 December 2014. Retrieved 8 September 2014. ^ "The 50 Best Tech Products of All Time". PCWorld. 2 April 2007. Archived from the original on 6 September 2015. Retrieved 5 September 2015.